But, having now been behind the wheel of the car, we have to admit that indifference – or even contempt – were way off the mark. For the Aurion is an outstanding car, one that richly deserves the awards that have been heaped on it and a car that on the road justifies its outstanding export record. If it was badged Audi or Volvo or Saab, this is a car that would cost tens of thousands of dollars more. 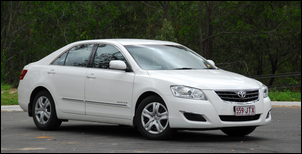 Indeed, in base model AT-X form, the $34,990 Aurion is a driving enthusiast’s bargain buy. Driving enthusiast? Front wheel drive, a Toyota and an Aussie-built six? Surely we’re joking! Across challenging back secondary roads, typically Australian with off-camber, bumps, stippled bitumen and tightening radius corners, the Aurion just powered along, immensely confident and sure-footed. The stability control didn’t unduly intrude, and the throttle response, superbly weighted steering and long-travel suspension simply dismissed the difficulties with poise and precision. And that was at night... the headlights are also excellent. Curiously, on demanding roads, the car that the Aurion most reminds us of is the first series Lexus LS400. The Aurion has the same relaxed ability to absorb big bumps and yet still turn-in without excessive roll or lurching. The suspension comprises bread and butter front MacPherson struts and rear multi-link struts – the excellence is in the tuning of the spring, anti-roll bar, bush and damper rates. Note that here we’re stressing real-world, Australian conditions – not a smooth race track! Now all this might suggest that this isn’t a family car - but that is also far from the mark. 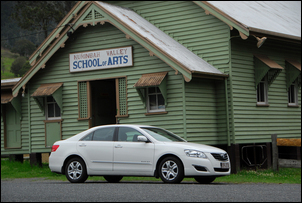 The Aurion might have the same cabin design as the four cylinder Camry, but in most directions there is a heap of room. Legroom (in both the front and back) is excellent, even with four tall occupants. The seats are large and very comfortable, having a particularly good match with the natural frequency of the suspension. The boot is huge and of a very useable shape; a full size spare wheel is included. However, the boot hinges intrude into the boot volume as the lid is shut, and the opening is such that large cube-shaped items are not be able to be inserted. The back seat does not fold. Rear headroom for tall people is marginal, and the rear seat width is not as great as in Falcon and Commodore. The latter is likely to be a problem only when carrying three abreast, or an adult either side of a central baby seat. The rear central floor hump is unusually low. Vents on the back of the centre console are provided for rear passengers – with fan assist, ventilation of the whole cabin is fine. Door pockets are provided but they’re not generous, with the rears particularly hard to use. 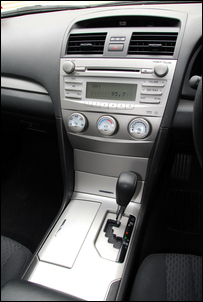 Other downers of the interior are silver surfaces on the centre console and central part of the dash that scratch easily, air con controls on the test car that could be wriggled from side to side (yes, all three knobs! 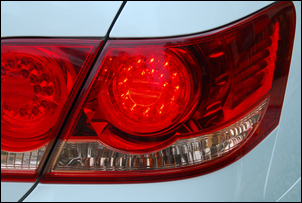 ), and non-illuminated electric mirror controls. The equipment level in this base model is excellent. There are six airbags (independent crash testing indicates a 4-star rating) and the driver’s seat is fully electrically adjustable. A single MP3-compatible CD radio is provided, although in the car we drove the front-right speaker had a slight buzz. However, the biggest downfall of the sound system is its glaring, white night illumination. It cannot be dimmed with the rest of the instruments and is stupidly distracting. In fact, it’s so bright that it illuminates the centre of the rear seat! Another negative is the tiny and hard-to-access over-speed warning. This looks like an afterthought - and an integrated fuel consumption read-out is noticeable by its absence. The dash in the test car also had lots of creaks when it was cold – they went away as the ambient temp rose. The instrument lighting is very effective (too effective in the case of the sound system!) and the instruments are clear and easily able to be read in all conditions. The tacho is redlined at 6500 rpm and the speedo reads to (an irrelevant in Australia) 260 km/h. The cruise control retains the decade-old Toyota approach of using a dedicated stalk; it’s something we think works better than the steering wheel buttons now preferred by most manufacturers. A foot-operated parking brake is fitted. Despite near-universal disdain by motoring journalists for this approach (rather than a centre console pull-up lever), a foot-brake has a major advantage for anyone who is smaller or who has back or shoulder problems – it’s much easier to operate. In urban conditions the car feels quick and responsive. 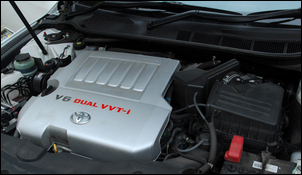 The variable valve timed, 3.5 litre DOHC V6 pumps out 200kW at 6200 rpm and 336Nm at a high 4700 rpm. However, even with the high revs at which peak torque is developed, the standard 6-speed auto makes the car feels grunty everywhere. Left in full auto mode, the trans is intelligent and generally gets things right, although it can be slow to drop more than one ratio when sudden acceleration is requested. Its ability to hold the right gear up hills is excellent. Manual mode is selected by moving the lever sideways out of its wobbly gate; the gear lever is positioned very close to hand so working the ‘box in manual mode feels natural and can be part of the driving flow. Playing point-and-squirt in urban conditions is about the only time you can tell it’s the front wheels that are doing the torquing; driven very hard in this way, you can occasionally feel the steering weight and the self-centre’ing characteristics alter. Actual old-fashioned torque steer is completely absent. The engine isn’t as refined as some of its competition, with a slightly throbby idle (and, in the test car, very high idle revs following a cold start), but it’s still by any measure an excellent design. Wind and engine noise are well suppressed, but the 215/60 Bridgestone Turanza tyres can be noisy on coarse chip bitumen surfaces. But we’ve left perhaps the best to last. On test, the Aurion recorded a fuel consumption of 9.6 litres/100km – considering the size of the car and its performance, that’s very good indeed. Most of the test distance was on freeways or secondary country roads, but at least a third was spent in city traffic conditions. The government test figure for the car is 9.9 litres/100km, and the car uses standard 91 RON fuel. The Aurion is a highly impressive car, well matched to those who want a large car with comfort, performance, a superb ride-and-handling match for real-world Australian conditions, and fuel economy that in its class is excellent. The Aurion was hired for this review.